This was a hike to explore the Baty Butte trail. It was forecast to be very warm, so I tried to leave a little earlier hoping to escape the heat a bit. The trail was easy to find, however the road going to the trailhead was a bit of an adventure. Nothing my truck couldn’t handle easily, but a few rough spots along the way. The directions to the trailhead were spot on. Had no trouble finding the trailhead at all. We started out about 9:45 and had a great view of Baty Butte. Once on the trail, we quickly came to the junction of the main trail and before we knew it, were right under the “white spot” of Baty Butte. From there, we continued around the East side of the butte and then headed East to an old decommissioned road to head over to Skookum lake. The trail is well flagged, however there are a few spots that were a little confusing. Did some brushing of the trail in the worst spots, but all in all, this trail is in great shape. There were a LOT of buzzing/flying things (flies, bees, yellow jackets) around. Fortunately, I didn’t get stung like I did last week. and rounded the corner to the campsite, and ran into a BUNCH of people (probably 10-15 people). They were all very nice and were waiting for the campers to leave and then had planned to stay the night. There wasn’t much to see, so we turned around and went back the way we came. Got back to the trail junction and decided not to go south, since we were running low on water and there really isn’t any water sources on the trail to speak of. The south section will have to wait for another day. It was a beautiful day up there, not too warm. Most of the trail is shaded, and there was a breeze most of the time which kept it comfortable. The trail is beautiful, with LOTS of open vistas of the area. I can’t think of another trail in this area that has so many opportunities to view the surrounding area so well. Although I don’t particularly like hiking on old decommissioned roads, that part isn’t too bad. The trail down the road has been smoothed out a bit. From the description on the TrailAdvocate site: Officially only a mile long trail skirting Baty Butte this trail actually continues some six miles along the Molalla-Clackamas divide running south beyond the powerlines and then down to Joyce Lake. Sometimes it is referred to as the Boundary Trail. 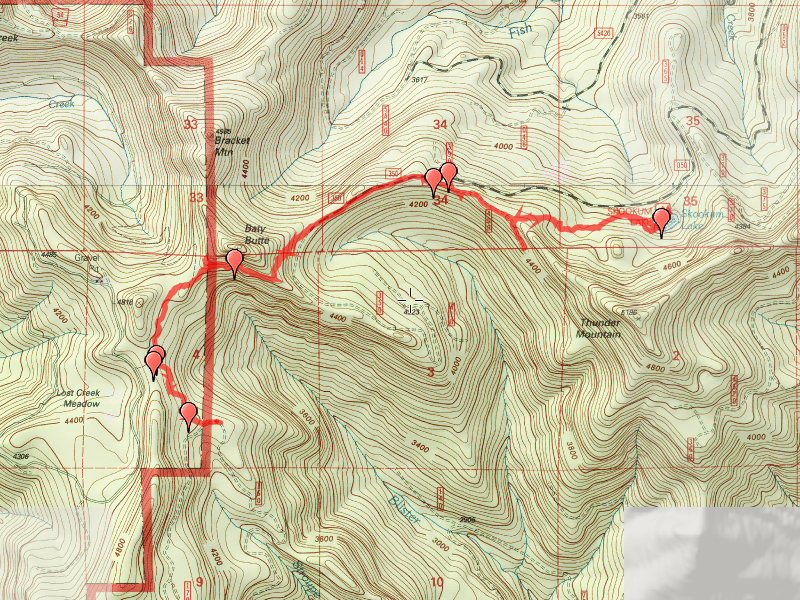 There are two access points north: Lost Creek Meadows and the northmost point on the 7010-160 spur. As you drive up the 160 spur watch for Baty Butte — a distinctive white “beard” on it’s south face* — and as you turn away from it there will be a long abandoned deck of logs on the right. The trail is just over this deck. There is no real parking spot except for squeezing in off the road. 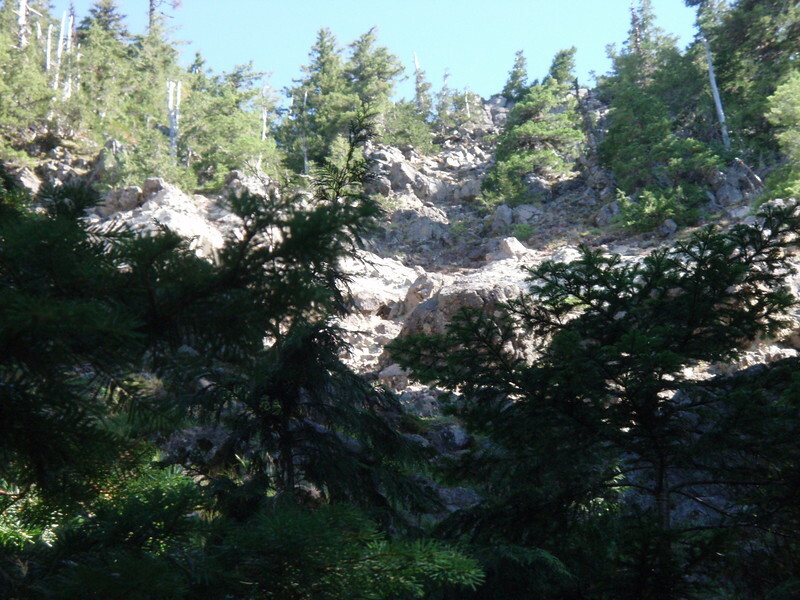 This is a segment of the old South Fork Trail, formerly a first class route from Estacada to Bagby Hot Springs. The Lost Creek Meadows trailhead is on the right in a level stretch of road shortly after the end of the climb up the hill. There is room for a few rigs to park on the left. Two south access points are the powerlines (a wild flower paradise) at the crest of the ridge and at Joyce Lake left at the entrance to the lake (not at the lake!) 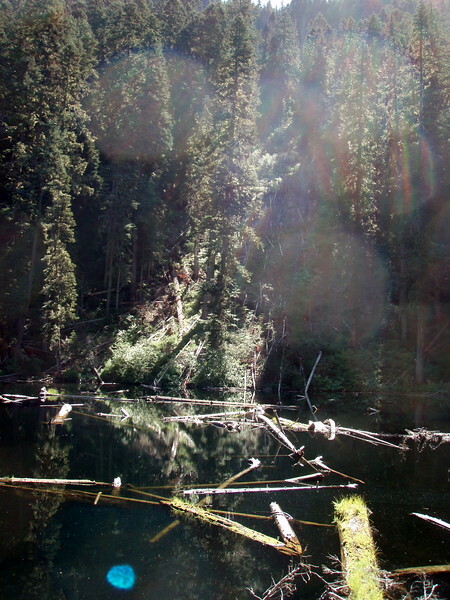 at Joyce Lake Road (BLM). A powerline access road leads up to the crest of the ridge. Trail runs both directions along the ridge from the clearing. Trail is maintained by users. The north three miles of the trail are better maintained than the south end. There are no signs. Trail survives by virtue of its scenery, wild flowers, and views. There is usually a breeze. An historic trail well worth investigation. Frequented by hunters in the Fall. Biologists have some interest in the flora. The route is not particularly strenuous.